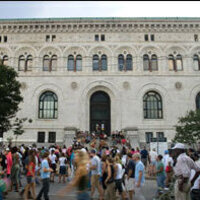 Completed in 1908, MICA's Main Building was designed to evoke a feeling of the Grand Canal of Venice, circa 1400. The Main Building houses painting and drawing studios, undergraduate photography department, foundation department, two departmental galleries, undergraduate admissions and the President's Office. Wonderful to have such a preeminent artist and scholar visit and discuss. Cool, great costumes, and building set up - I just wish that the costume contest registration had been open longer or not online. Best Halloween party in Baltimore. This was a great event. MIQA and FASQA did a great job. Great lecture. Very interesting topic.